Girl meats Paleo: Product Review: Paleo Brands "Almond Crusted Cod"
I'm planning on taking my family on a picnic but still mulling over what to pack that will be yummy for the group and Paleo for me and J. If you have any suggestions, by all means, send them my way! On to today's tidbit: round II of Paleo Brands' frozen meals. 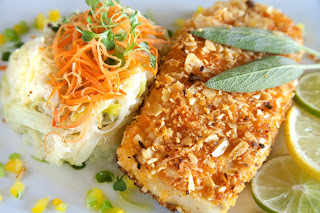 This time I tasted the "Almond Crusted Cod with Spicy Vegetables and Cauliflower Leek Puree." When I placed my order (you have to choose 12 frozen meals for shipping purposes) I decided to select 3 of these since they seemed like one of the more appealing recipes. Of course, I thought similarly of the Beef with Curry Pistachio Stuffing and Broccoli. This meal is higher in fat and calories than the others. I wondered how this could be since it is comprised mainly of pureed cauliflower and white fish. Yes, there is an almond crust but it is a mere dusting. Further inspection of the ingredients list reveals that there was a mayo in the cauliflower/leak puree (WHY?) and this mayo contained soybean oil. Not cool, especially since it in no way improved the flavor. Yes, flavor. It's what makes eating so dang enjoyable and ever since going Paleo my meals have been succinctly delicious. I am baffled once again by this company's line of frozen meals. The cod looked appealing in the package. It was a reasonable serving of protein along with some colorful veggies and a hearty portion of smashed cauli (and I loooove me some schmalipower). I even plated it so that my eyes would be visually appeased. Before me was what looked like a good meal. But as I tasted, re-tasted, pondered, reheated and doctored my meal there were two absolutes: it had an unappealing texture and was tasteless. The texture was similarly disturbing to that of the beef with stuffing that I previously reviewed. It was mealy. The nuts seemed too finely ground and yet, simialrly, soggy. It was an alien mouthfeel. I'm not persnickety about texture but here it was off-putting. And as for flavor.....wait, flavor? Other than notes of spiciness there was no flavor. I have tried many a dieter's frozen meal in my time, liking most, and this is the worst recipe I've ever tasted. There was nothing there. It felt like eating beige. So there I was eating mealy beige. I tried to liven it up first with a small amount of salt and then with juice from an orange I had brought along (thank God for that orange, only tasty thing in my lunch). Nether condiment was able to improve the dish. I'm still baffled as to how one can produce something that tastes like soggy cardboard. Now perhaps I'm being unfair. There was ONE flavor that came through: the cod was overwhelmingly fishy. Disturbingly fishy. I convinced a co-worker to try it and she entreated me to not eat another bite. So yeah, if I don't live to blog tomorrow then we know who to blame. You just saved me $70...thank you! Did you try their jerky? I'm a paleo newbie but honest, I don't get buying frozen per-perpaired anything. I make all my meals from scratch from simple, fresh ingredients. I watch people at the supermarket all the time buying endless boxes of god knows what and shake my head. That can't be food? I agree with the review. Not good at all.